The inaccuracies were done to help advance the plot or to add drama to the film which is exactly the artistic license we should be willing to grant the filmmakers. This is entertainment, not a documentary. The same can be said about Planetes (2003), one of best ever "near-future" hard-SF anime series. It also involves space debris, in this case a crew of astronaut janitors responsible for cleaning up the dangerous junk zipping around in low Earth orbit. The first half of the series follows rookie Ai Tanabe as she joins Debris Section, under the tutelage of the young and brash "Hachi" Hoshino. These procedural episodes are some of the best, made all the better by interesting characters and attention to accuracy. In a way, Planetes, is scientifically honest enough to argue against the idealism of its own premise: showing a child raised in a low-gravity environment to frail to ever return to Earth, and the debilitating effects of long-term exposure to radiation. The series then gets taken over by Hachi's efforts to qualify for a 2001-style exploratory mission to Jupiter, and a bunch of economic terrorists determined to sabotage the project. The latter of these two storylines is the weakest. The litanies of zero-sum, socialist complaints about poverty quickly become tiresome, though in the same way that activists of this sort always wear out their rhetorical welcome. So maybe it's on purpose. In the end, the political arm of the movement sells out the militant arm in exchange for a legislative pat on the head. I did find that totally believable. Be a sadist. No matter how sweet and innocent your leading characters, make awful things happen to them, in order that the reader may see what they are made of. In the process, Hachi becomes a monomaniacal astronaut jerk, and inevitably ends up in a life-or-death struggle with a monomaniacal terrorist jerk. That these are realistic depictions of human nature doesn't make them any more pleasant to watch. But stick with it. 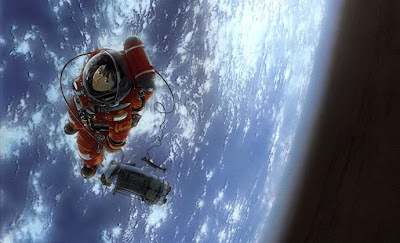 In the final episodes, Hachi's and Ai's character arcs fully develop, intersect, and pay off big time, giving Planetes one of the most rewarding endings--while not losing anything in terms of authenticity--of any anime series. Hachi's eventual change of heart and reformed outlook on life is real and earned. In purely scientific terms, Planetes suffers from some of the same technical quibbles as Gravity: the orbital changes required to complete their missions would be impossible with the technology on hand. Orbiting a planet is not like flying a plane. The more glaring anachronisms include the chain-smoking Fee Carmichael (her nicotine addiction does make for funny comic relief). And a large lunar base would be completely buried to shield it against cosmic rays, solar flares, and micrometeoroids. But when it comes to science fiction on the big screen and small, making a good-faith effort to get things right counts for a lot. The producers of Planetes paid attention to their JAXA advisors. In that light, the science in this science fiction gets an "A" for effort.